Welcome To The MPS Historical Archive! To browse through our online archive of documents and photographs, click on "Schools and Facilities" on the top navigation menu. The first educational institution in Minneapolis was started by Rev. J.D. Stevens on the shores of Lake Harriet in 1834. It was for children, including those from Cloud Man's band of Mdewakanton Dakota and from Fort Snelling. 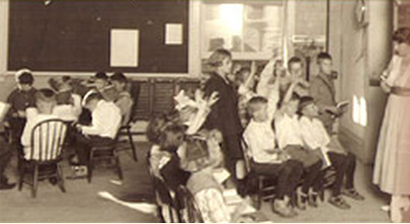 By 1849, in St. Anthony, the first private or subscription schools opened. Then in 1851-52, a school was opened on the west side of the river by Mary Schofield.